Hello and Happy Hump Day! Hope your week is going well! It's been snowing here in Middle Tennessee and has been soooo cold! We typically don't get much snow here so we don't have the equipment to clean off the roads. I had gone into work on Tuesday morning and left the office early because I had heard that the road condition was getting bad. I did really well almost all the way home until I got to my exit and started sliding all over the place. Thankfully I had left early and there was no one else in the vicinity. It was pretty scary and I definitely felt blessed that everything came out ok! Hopefully today will be much better although we aren't expected to warm up around here until the weekend! I'm thinking I should retire in Florida and enjoy some warmer winters! 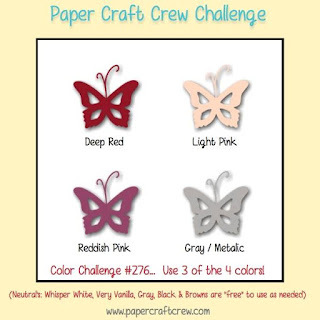 So today I'm over with my talented friends at the Paper Craft Crew with a card for a color challenge! So I made two cards.. I couldn't decide between the two. My first was with Stampin' Up! Bloomin' Hearts Thinlits dies. The first card was primarily die cutting.. the only stamping was the sentiment and that was heat embossed. I kept this one fairly simple! The second card is with Unity Stamp Co. Huge Possibilities. 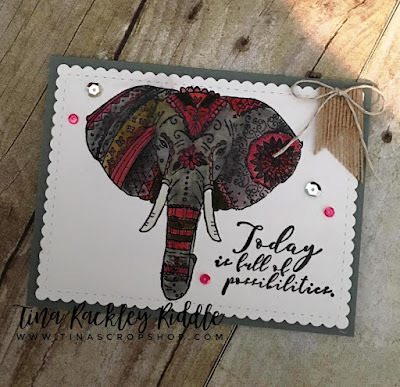 The Elephant was heat embossed in black and watercolored with Tim Holtz Distress Inks. I just love this elephant! I also love the coordinating sentiment! It's nice to have encouraging sentiments in your inventory! Labels: Challenge Card, Huge Possibilities, Stampin' Up! Bloomin' Heart Thinlits Dies, Unity Stamp Co.